Altmärkisches Kaltblut (cold blood) horses were developed in the 19th century with a foundation stock of Percheron, Belgian, and Shire horses. The result was a versatile, genial animal with a good work ethic, gaining them instant recognition. Altmärkische Kaltblut hosrse thrived until the early 20th century brought war, which took its toll on many draft breeds of Europe. Today they are very rare, with a remaining population of 120 mares and 20 stallions keeping the gene pool alive. 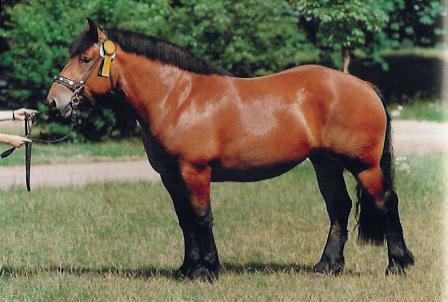 There is an attempt to revive the breed using Belgian stallions that fit the characteristic performance phenotype. Altmärkisches Kaltblut horses come in all solid colors and are 15.2 to 16.1 hands high. They have a striking head with straight profile and large eyes. They have a strong, well-positioned neck; a medium length and strong back; a deep chest with sloping shoulder; and large hard hooves.